Serving African American Children was initiated to present an African American perspective on child welfare issues affecting African American children. 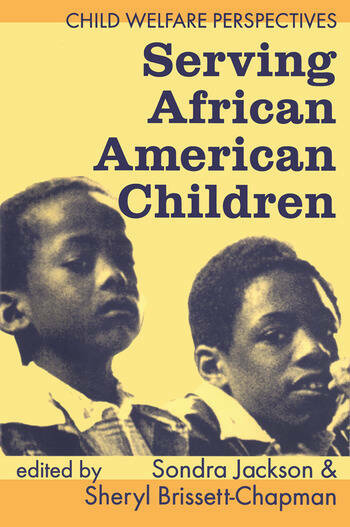 The chapters in this volume challenge the child welfare community to ensure that all African American children receive protection, nurturing, and an improved quality of life; to create and sustain mutual communication and support through program development; to ensure that African American consultants are involved in the evaluation of agencies where African American populations represent a significant proportion of the service population; and to increase African American leadership through education and training opportunities in preparation for executive level positions. Major chapters and contributors to Serving African American Children include: "Family Preservation and Support Services: A Missed Opportunity for Kinship Care" by Julia Danzy and Sondra M. Jackson; "Achieving Same-Race Adoptive Placements for African American Children" by Ruth G. McRoy, Zena Oglesby, and Helen Grape; "African American Families and HIV/AIDS: Caring for Surviving Children" by Alma J. Carten and Ilene Fennoy; "A Rite of Passage Approach Designed to Preserve the Families of Substance-Abusing African American Women" by Vanesta L. Poitier, Makini Niliwaambieni, and Cyprian Lamar Rowe; and "An Afrocentric Program for African American Males in the Juvenile Justice System" by Aminifu R. Harvey and Antoinette A. Coleman. The chapters reflect a variety of policy, research, and practice issues; clinical techniques and treatment models; and new perspectives in child welfare. The theme that runs throughout each chapter is the grave concern about the overrepresentation of African American children and families in the child welfare system, and about the limited—if not missing—influence of the African American perspective on policy and practice. Serving African American Children is a book of vital importance and should be read by all social workers, sociologists, African American studies specialists, and professionals in the field of child welfare.